Mature citrus trees affected by the bacterial disease huanglongbing (HLB) typically need about 25 percent less irrigation than their healthy counterparts However, that doesn’t necessarily mean young trees with the disease will benefit from water deficits, according to a preliminary greenhouse study by researchers with the University of Florida Institute of Food and Agricultural Sciences (UF/IFAS). Experiments on 1-year-old orange trees showed similar responses to irrigation in healthy trees and those affected by HLB. Diseased or not, the trees grew faster when they received daily irrigation that kept pace with losses from evapotranspiration, a measurement that combines two types of water loss — evaporation from soil, trunk, stem and leaf surfaces, and losses from transpiration, the process by which water vapor exits the tree through its leaf pores during the day. 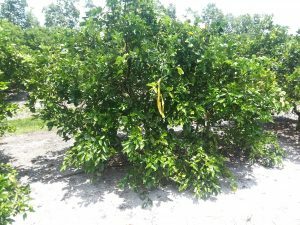 This result suggests that young, HLB-affected trees benefit most from a “full ration” of water, a finding that surprised researchers, said soil and water science expert Davie Kadyampakeni, an assistant professor with the UF/IFAS Citrus Research and Education Center in Lake Alfred. The study was funded by the UF/IFAS Citrus Research Initiative. 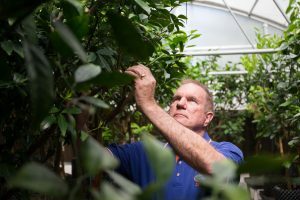 In recent years, UF/FAS researchers have determined that mature HLB-affected citrus trees require about 25 percent less water than their healthy counterparts, he said. The exact reasons are unclear, but reductions in leaf area and root function have been cited as possible causes. Because mature HLB-affected trees often continue to produce marketable fruit for years, one of the top priorities for UF/IFAS citrus experts is to find methods of supporting tree health throughout the early stages of the HLB disease process. Results from the current study suggest that the team may have uncovered an important new aspect of the disease process, and that the state’s growers might want to consider providing full irrigation to all young trees, regardless of their HLB status, he said. The team conducted the irrigation study as part of a larger project aimed at improving management of citrus trees affected by HLB, he said. The scientists assessed the effects of both irrigation rates by measuring the stem water potential of individual trees. Roughly analogous to the blood pressure measurements that doctors use to assess human health, stem water potential measures the degree to which water is present in a specific piece of tree tissue –typically a single leaf — and treats the result as an indicator of the tree’s overall hydration status, due to the fact that water circulates freely throughout the tree via water-conducting tissue known as the xylem. Consequently, stem water potential is often employed to determine whether citrus trees are experiencing water stress. Results showed that HLB-positive trees showed the same degree of water stress as their healthy counterparts after six months on the same regimen. More importantly, HLB-positive trees that received full irrigation — equal to 100 percent of evapotranspiration — grew taller, developed thicker trunks and achieved greater root length density, compared with trees receiving irrigation equal to 75 percent of their evapotranspiration rate. Similar results were found in healthy trees. Also, healthy trees grew faster than their HLB-positive counterparts. The overall project, which included experiments concerning nitrogen fertilization and soil amendments, was conducted by Kadyampakeni and colleagues Arnold Schumann, a soil and water sciences professor at the Lake Alfred center, and soil microbiologist Sarah Strauss, an assistant professor with the UF/IFAS Southwest Florida Research and Education Center in Immokalee. Findings from the study will be published in the near future, Kadyampakeni said, and he plans to pursue further research on the possibility that soil amendments including compost and biochar might be used to increase the water-holding and nutrient-retention capacity of sandy grove soils. In the current scenario of widespread infection and severe symptoms of HLB in Florida, horticultural practices that improve plant health in the presence of the disease are needed. For this reason, we sought to follow up on reports of positive effects of a brassinosteroid on infected plants. Brassinosteroids are a relatively newly discovered group of plant hormones that regulate multiple developmental and physiological processes. 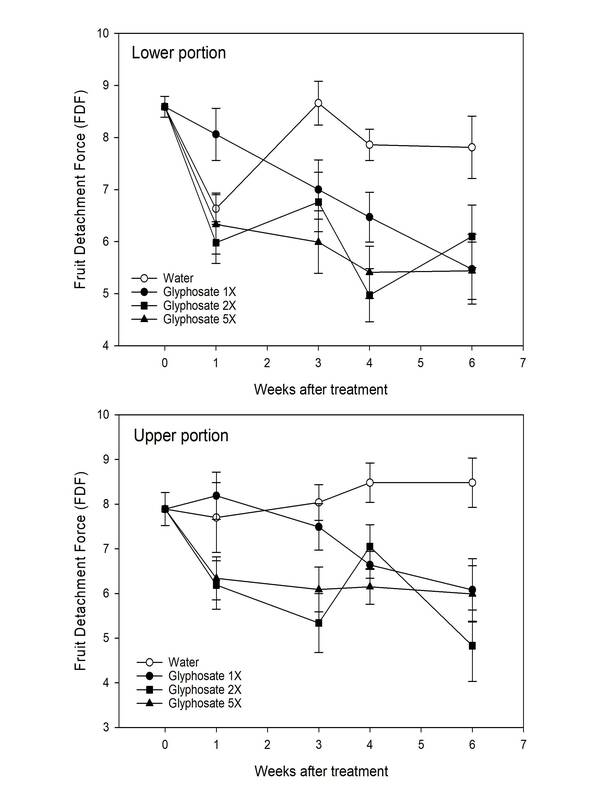 Most interestingly, brassinosteroids induce disease resistance in a great number of crop plants against bacteria, fungi, oomycetes and viruses. Brassinosteroids are present in two active forms, epibrassinolide (EBL) and homobrassinolide (HBr). Recently, EBL was shown to reduce Candidatus Liberibacter asiaticus (CLas) bacterial titer and alleviate symptoms of HLB in mature citrus trees in Cuba. The results of the Cuban study, over a 12-month period, were impressive: In a greenhouse trial, bacterial titers were reduced to non-detectable levels. In the field, a seven-fold reduction of bacterial titer was measured. This effect seems to be mediated by the activation of a large number of defense-related pathways in the tree. However, the long-term effects of this treatment on tree health and fruit yield and quality were not assessed. HBr is commercially available in the United States and has been proven effective in increasing resistance to disease in other plants such as tobacco and apple. Hence, there is an opportunity for testing HBr in citrus trees grown in Florida under HLB-prevalent conditions. A research project, funded by the University of Florida Institute of Food and Agricultural Sciences (UF/IFAS) Citrus Research Initiative, started in December 2017 with the overall goal of assessing effects of HBr on citrus tree health, fruit yield and quality. The project also includes assessing CLas bacteria titer in the central and southern citrus-producing regions of Florida to ensure that results are applicable statewide. Researchers are conducting experiments in groves in Lake Alfred at the Citrus Research and Education Center and in Immokalee at the Southwest Florida Research and Education Center (SWFREC) using the same varieties (6- to 8-year-old Valencia trees on Swingle rootstock) and experimental design. Starting in December, spray treatments were performed every two weeks for six months at both locations, following the dosage and frequency published in the Cuban study. 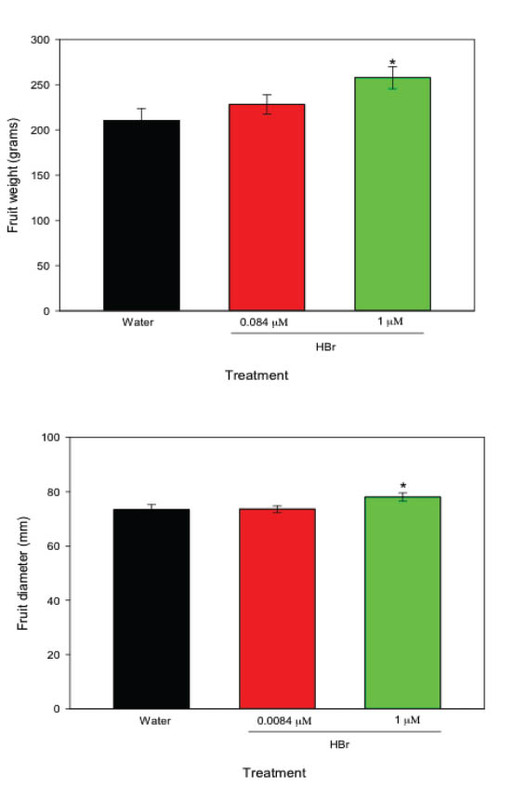 Treatments were: 1) water (control), 2) 0.084 micrometer (μM) HBr and 3) 1 μM HBr. Fruit detachment force (FDF), fruit drop and fruit peel coloration were tested. Leaves were collected from every individual tree monthly to measure bacterial population. Timing of flushing and blooming in treated trees was also assessed. 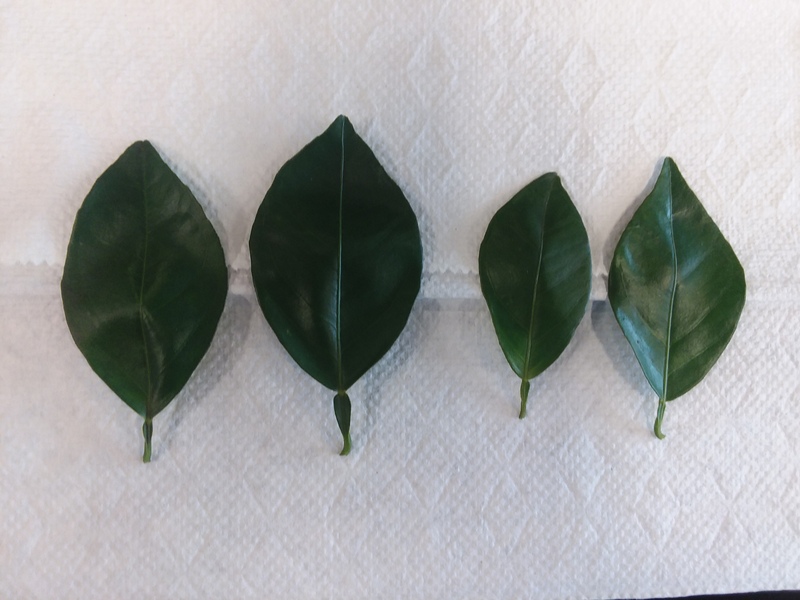 Canopy volume, trunk diameter and leaf chlorophyll content in new, fully expanded leaves were examined as well. Although the experiment is still in its first year, we can report on certain trends in tree health, fruit yield and quality. The treated plants must be followed further before recommendations can be made to Florida growers. Bacterial population was assessed monthly by real-time polymerase chain reaction according to U.S. Department of Agriculture Animal and Plant Health Inspection Service recommendations. Prior to the start of the experiment, all trees were HLB positive. After six months, no significant differences were observed between control trees and trees that received HBr. Chlorophyll content was evaluated non-destructively at two different times after the first application in December: 1) in March, after new leaves were fully expanded and 2) in May, when these same leaves were mature. 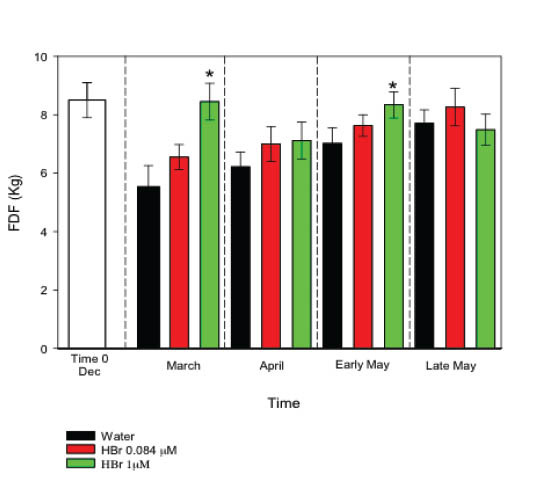 Data show that chlorophyll content was significantly higher in leaves from both HBr treatments, and these differences increased with time (Figures 1A and 1B). 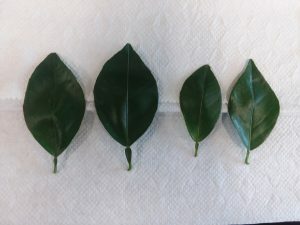 There were no differences in canopy volume and trunk diameter among different treatments, though it is likely that six months is too early in the course of the study to find whole-plant differences. 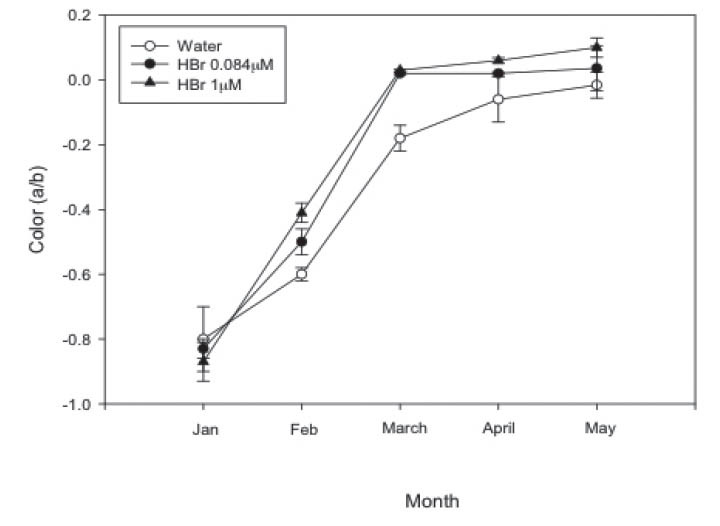 Noticeably, we found that blooming occurred 10 days earlier in HBr-treated trees (irrespective of the dosage) as compared to the non-treated trees, and flowering was profuse and uniform (Figure 1C). These effects were more pronounced in trees at the SWFREC experimental site. Trees showed denser and darker-green canopies after the June flush when compared to the beginning of the experiment (Figures 1C and 1D). Color measurements were taken monthly using a portable Minolta color meter. Color break and development occurred earlier in trees treated with HBr at both concentrations compared with untreated trees (Figure 2). This effect disappeared over time and by the end of maturation (May 25, 2018). There were no significant differences in fruit coloration. FDF was higher at higher HBr concentrations in March and early May (Figure 3). Total fruit yield at the end of the experiment was higher in trees treated with higher HBr concentration (242.5 pounds) compared with trees treated with the lower concentration (210.1 pounds) and with water controls (191.7 pounds). Average fruit weight and diameter increased significantly in response to the higher HBr concentration (Figure 4). The higher retention force of the fruit to the tree may explain the increase in yield at the end of the experiment. The effects observed after the treatments with HBr were not what we initially expected, as we were more interested in assessing reduction in bacterial infection in the citrus trees. However, we observed advanced blooming date and acceleration of fruit maturation. Trends regarding tree health, fruit yield and quality observed after HBr treatments are worth following. Determining appropriate timing of product application may allow HBr to be used as a new management tool for Florida citrus growers. The lack of effect on bacterial population could be due to the fact that the study is still in its early stage. 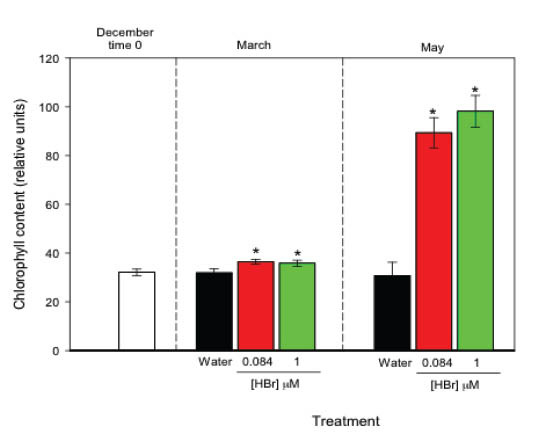 Nevertheless, results from our study suggest that HBr treatment may improve tree health and, therefore, tolerance and productivity of infected trees. The study will continue for an additional year to investigate whether homobrassinolide applications are a suitable management practice to combat HLB. Acknowledgements: This research was funded by the UF/IFAS Citrus Research Initiative. The HBr used in this study was a gift from Repar, Inc. in Maryland. Thank you to the HLB Detection Laboratory at the SWFREC for diligent analysis of samples. Fernando Alferez, Christopher Vincent and Tripti Vashisth are UF/IFAS assistant professors. Herbicides are one of the key inputs necessary for effective management of a wide diversity of weed infestations in citrus crop production. Most weeds in citrus could be controlled by adopting a weed management program that utilizes a combination of herbicides based on their selectivity and compatibility with the crop. This would be considered more cost-effective than present mechanical and cultural methods of weed management. After introduction in the 1970s, glyphosate (example trade name: Roundup), became very popular among citrus growers for its broad-spectrum weed control under trees and in row middles. The use of glyphosate as a “burn-down” application, alone or in combination with other herbicides, became a standard practice in citrus groves. 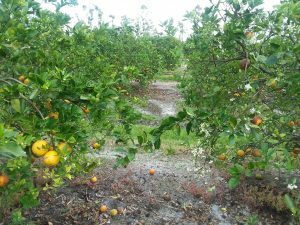 Glyphosate, because of its non-selectivity and relatively low cost, is used extensively for post-emergent weed management in Florida citrus. A National Agricultural Statistics Service report from 2010 reveals that 72 percent of orange and 63 percent of grapefruit groves received glyphosate treatments, underscoring the importance of glyphosate as a major herbicide option for citrus growers. Glyphosate, with its broad-spectrum of activity, is very effective at controlling a wide range of weeds, but many recent scientific reports suggest a relationship between extensive glyphosate application and adverse impacts on non-target plants. As glyphosate use has increased in various crop production systems, several concerns have arisen associated with this herbicide’s interaction with available nutrients, phytotoxicity and passive effects on plant pathogens. Chief among these concerns are: 1) increased crop sensitivity to diseases, 2) reduced availability of micronutrients to crops through chelation and 3) inhibition of root growth. 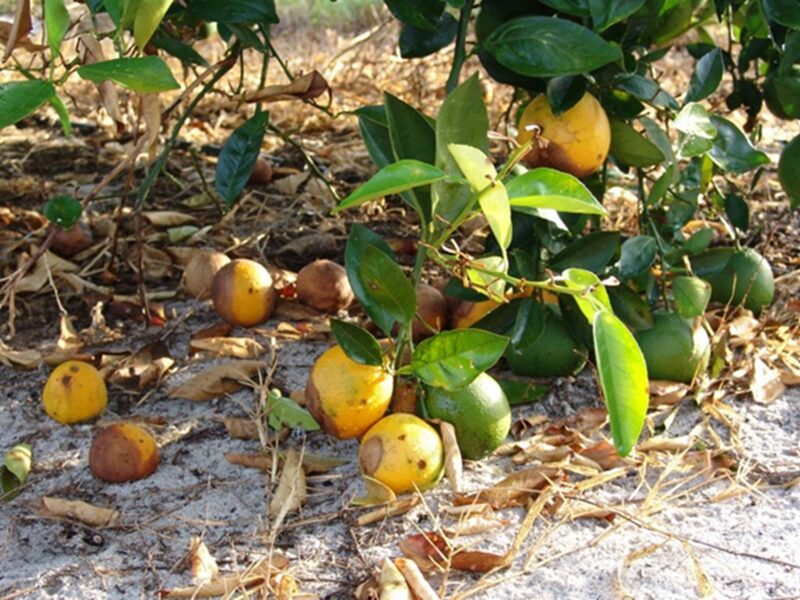 As citrus weed management programs have continued to rely more heavily on glyphosate, the occurrence of citrus fruit drop resulting from glyphosate application has become an increasing grower concern over the years. Glyphosate-related fruit drop usually occurs in fall and coincides with the application of glyphosate in late summer/early fall in early-season citrus varieties. Some research reports have suggested that susceptibility of fruit to glyphosate increases as it nears maturity. In one such study by D.P.H. Tucker in 1977, glyphosate sprayed on 6-week-old citrus fruit did not show damage and drop. However, when the herbicide came in contact with 5-month-old fruit, extensive drop was observed. As fruit develops, especially on younger trees, heavy fruit-bearing or low-lying branches are more likely to come in contact with sprayed herbicides, resulting in glyphosate contact with the fruit. There are several potential routes through which glyphosate can enter the citrus tree, including absorption through leaves and other green or woody tissues following contact with spray and root uptake from the soil. Only fruit that comes in direct contact with the glyphosate spray during the susceptible period may be subject to glyphosate-related fruit drop. Also, glyphosate residues persisting in the soil are available for root uptake by the trees. Glyphosate is found to accumulate in the soil and the plant tissues. Hence, recurring applications add cumulatively to previous doses, and such increasing concentrations may pose problems in future years. The exact reason behind the glyphosate-linked fruit drop is not known. However, glyphosate has been shown to enhance ethylene production in plant tissues. Ethylene is known to induce leaf and fruit abscission in maturing citrus. Possibly, exposure of maturing citrus fruit to glyphosate could result in elevated concentrations of ethylene and consequent fruit drop. One indicator of fruit drop is reduction in fruit detachment force (FDF), the force necessary to detach a fruit from the bearing branch, resulting in drop. Preliminary studies conducted at the University of Florida Institute of Food and Agricultural Sciences (UF/IFAS) Southwest Florida Research and Education Center show that FDF is affected by glyphosate in a dose-dependent manner. FDF is reduced considerably when glyphosate is applied at higher rates (Figure 1), indicating that higher doses of glyphosate are more likely to induce fruit drop. The objective of this study was to determine the effect of glyphosate dosage on the abscission of mature citrus fruits. Six-year-old trees of Valencia grafted onto Swingle rootstock received glyphosate (Round-up Power MAX) application at three rates in the summer of 2017. Glyphosate was applied with a tractor-mounted spray boom under the trees (in the rows). The treatments included a low rate (22 ounces per acre, one time), medium rate (55 ounces per acre, 2 times) and a high rate (110 ounces per acre, five times) of the herbicide. Water was sprayed from the herbicide boom in the control plots. The mature fruits were collected from the lower third and upper third portions of the tree at weekly intervals to assess the FDF with a pull force gauge. The observed reduction in the fruit detachment force suggests an increased chance for fruit drop. There are some ways growers can manage herbicide-related fruit drop. The following methods are recommended. Maintaining a safe distance between the sprayer boom and the tree while spraying herbicide is essential to avoid any potential spray contact with the tree. The herbicide boom should be adequately below the tree canopy to avoid contact with fruit. The boom must still be high enough to pass over the weeds for exposure to the herbicide spray. Mechanical damage from herbicide applicators as a cause of fruit drop is often overlooked by growers. Hitting the tree trunks with the herbicide boom will result in knocking down the fruit and hence should be avoided. Additionally, scratching on the tree trunk during herbicide application will expose the trees to chemicals and pests. The off-center (OC) nozzle is at the terminal end of the herbicide boom. Nozzle angle determines whether the herbicide application is directed upward and toward the tree trunk, foliage or fruit or downward at the intended weeds targeted. Optimal placement of the OC nozzle will minimize herbicide drift into the trees and prevent applying the herbicide directly to the tree. The greater the nozzle angle, the higher and further beyond the end of the boom the spray is directed, and the greater the chances for herbicide contact to occur in the tree canopy. Even a closed OC nozzle may help to curb the glyphosate-related fruit drop. Properly adjusted spray booms and well positioned OC nozzles can be used during the sensitive periods near fruit maturity to reduce fruit drop from direct spray contact. For more information on herbicide application best management practices in citrus, see http://edis.ifas.ufl.edu/ae246. Skirting or raising the tree skirts is another way to prevent herbicide spray contact with the foliage and fruits. Skirting is the process of pruning the low-hanging branches and limbs of the trees. This allows easy movement of herbicide spray booms and thus enables uniform herbicide application under the tree canopy and less contact with the foliage and fruits. Assuring good yield from citrus starts with preventing unnatural fruit drop of young fruit. 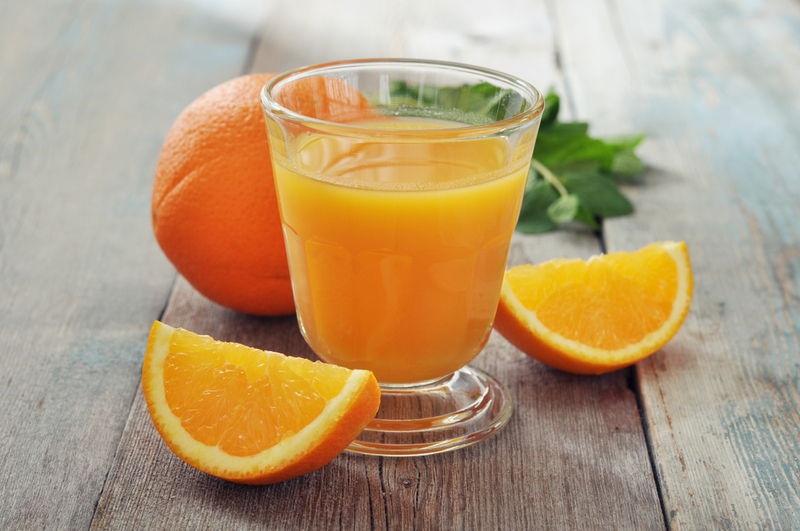 The herbicide glyphosate is linked to the loss of maturing fruit in citrus. Improper spray applications directed toward the tree canopy will result in herbicide contact with citrus fruits and immature fruit drop. Maintaining a safe spray boom distance and careful positioning of the angle of OC nozzles during the sensitive period near fruit maturity will help to reduce fruit drop from direct spray contact. Ramdas Kanissery, Fernando Alferez and Ozgur Batuman are assistant professors at the UF/IFAS Southwest Florida Research and Education Center in Immokalee. The University of Florida Institute of Food and Agricultural Sciences and Southeast AgNet are partnering to provide the latest news on citrus-related research in a monthly podcast. The podcast, “All in for Citrus,” will launch the last week in September and will feature short interviews with scientists working to find solutions to citrus greening and other devastating citrus diseases. “This is the latest tactic in a comprehensive communications effort launched this past summer by the UF/IFAS Citrus Team,” Michael Rogers, director of the UF/IFAS Citrus Research and Education Center in Lake Alfred, Fla., said in a news release. The podcast complements the new website, citrusresearch.ifas.ufl.edu, and a new monthly newsletter, according to the release. Florida citrus growers recognize the Sugar Belle® mandarin hybrid for its tolerance of citrus greening disease, and new findings from the University of Florida Institute of Food and Agricultural Sciences suggest that rootstock selection may play a role in keeping Sugar Belle® trees productive even if they become infected with the bacterial malady. The research thus far has not involved trees already stricken with greening disease, also known by the Chinese term Huanglongbing or the acronym HLB. Studies on infected trees will be a future step in evaluating rootstock options for Sugar Belle®, Killiny said. 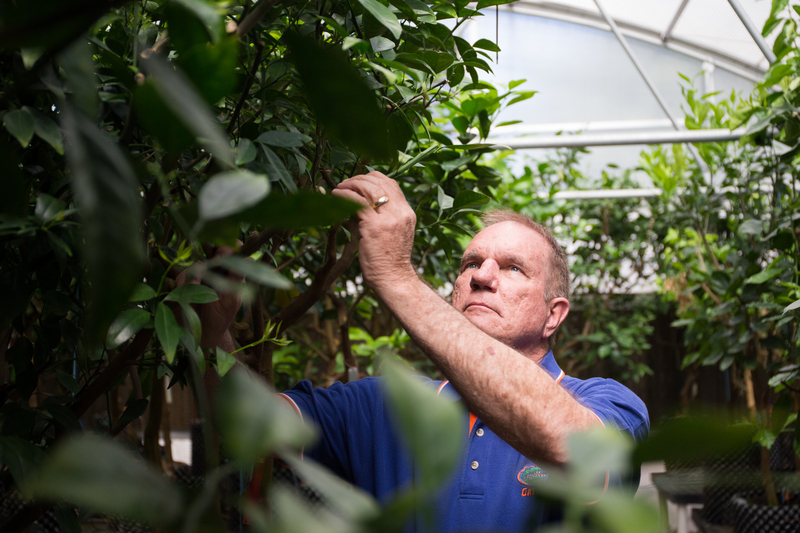 Developed by UF/IFAS citrus breeders and released in 2009, Sugar Belle® has proved to be more tolerant of HLB than most citrus varieties grown commercially in Florida, said Killiny, based at the UF/IFAS Citrus Research and Education Center in Lake Alfred. The disease is caused by an invasive bacterium that is transmitted by an invasive insect, the Asian citrus psyllid. HLB was first reported in Florida in late 2005 and subsequently spread statewide, drastically reducing yields. The current study, published earlier this year in the journal “Plant Signaling & Behavior,” showed that metabolic activity in three groups of healthy Sugar Belle® trees differed, depending on the rootstock used. As with most commercial citrus in Florida, trees used in the study consisted of two sections grafted together – a hardy root system, or rootstock, topped with a highly productive above-ground section known as a “scion” of a different variety – in this case, Sugar Belle®. 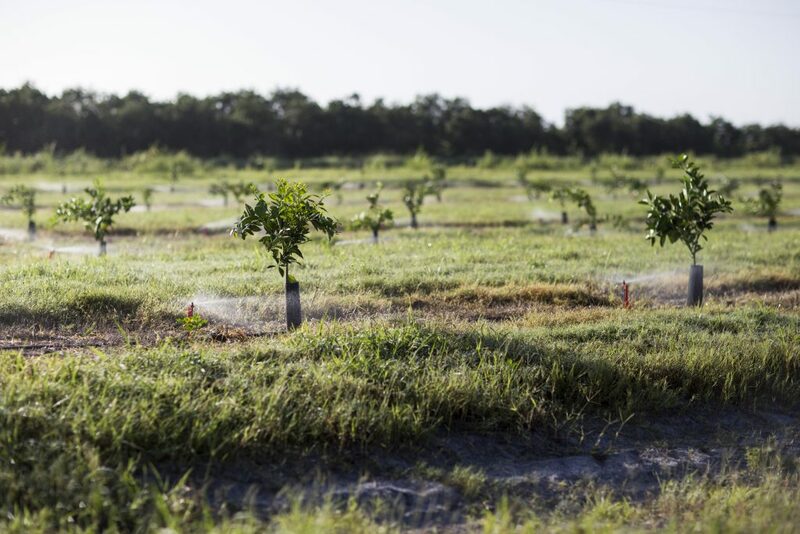 “We deliberately focused the study on Sugar Belle® trees that used three of the most popular rootstocks – Swingle citrumelo, Carrizo citrange and UF-15,” Killiny said. In the study, researchers purchased one-year-old Sugar Belle® trees from nurseries, acquiring 12 trees with each of the three rootstocks investigated. After acclimating the trees to greenhouse conditions for one month, the team took leaf samples from each tree, analyzing them with gas chromatography-mass spectrometry instruments to detect organic chemicals associated with plant growth and defense. Results from the analyses showed that the overall chemical profiles obtained from the samples varied significantly depending on the rootstock used. Although trees used in the study were not infected with HLB, Killiny notes that Sugar Belle® trees with Swingle citrumelo rootstock produced the greatest amounts of two compounds known to have antimicrobial effects, quinic acid and ferulic acid. Consequently, it appears likely that Sugar Belle® will tolerate HLB best when grown on Swingle citrumelo, because the two acids would probably limit the bacterial population, or titer, in an infected tree. These results led the team to conclude that, among the three rootstocks tested, Swingle citrumelo is probably the best choice for optimizing greening tolerance in Sugar Belle®. Funding for this study was provided by a $75,000 grant from the federal Citrus Disease Research and Extension program, which was authorized by the 2014 federal Farm Bill and administered by the U.S. Department of Agriculture through its Specialty Crop Research Initiative.